The office is open Monday to Friday between 10am and 2pm for pre-purchase of tickets. Door sales available from 30 mins before session start times. Phone, online and email reserves will be held until 15 minutes before the start of a session. Theatre doors opens 30 minutes before advertised start time. Arrive early if you want a comfy seat. 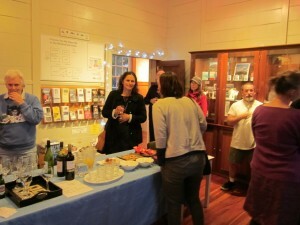 There is a cash bar with juice, Bundaberg drinks, wine, beer plus yummy food on sale. 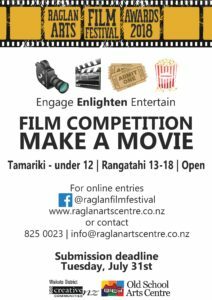 The feature film and RAFFA nominee screenings of the Raglan Film Festival will be held at the Raglan Old School Arts Centre, 5Stewart Street, Raglan. 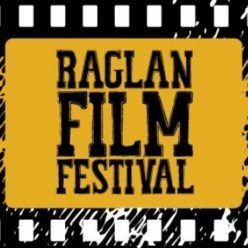 The 2018 Raglan Arts Film Festival Red Carpet Awards Night will be in the Raglan Town Hall, Bow Street, Raglan. Free off-street parking is available in the courtyard at the front of the Old School.